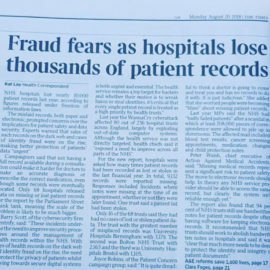 Post Tagged with: "the times"
Monday 20th August This morning, The Times reported on our new research paper, into NHS Patient Records, on page 2 of their paper. The report into data security in the National Health Service (NHS) reveals that nearly 10,000 patient records were lost by the NHS last year. The Times article can be found here and you can read our report here.